The year 2011 was a busy one for the Michiana Calligraphy Guild, but we loved every minute of it. Earlier this year Linda Bravata taught us to make marvelous cards in a workshop called “Card Tricks”. Marianne Burke came north from Kentucky to teach us to make books and we enjoyed learning many tips and tricks from both of these gifted instructors. 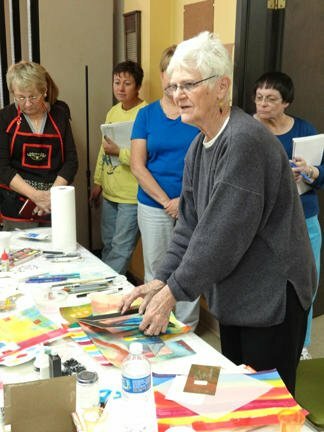 In early September, Anna Schlemma and I drove to Kalamazoo for three days to workshop entitled Flowing into Watercolor with Barbara Close and the Kalamazoo PenDragons. Anna and I had never spent three days in a car together and we had a wonderful time talking about family, life, and lettering. It was an experience I would love to repeat some day. The old saying, you never know anyone until you have lived with them or worked with them. Anna and I “lived” in the car and at the workshop and had a marvelous time! Barbara Close took us through many exercises and experiments the first two days including different ways to incorporate watercolor into your design and adding letters. On the third day, we learned to make textured letters with either watercolors or with zentangles. I loved those letters and have given several as gifts since then. In early October, one of our favorite instructors, Rosie Kelly, came to South Bend to make paste papers. Rosie is always so patient and kind and we happily spent our day making papers that we like to use for books. At the end of October, Louise Grunewald joined us at the South Bend Regional Museum of Art for a workshop entitled Making Marks. So, we spent another two days learning to make marks on paper but also to learn some new forms of design. I think one of my favorite parts of the workshop was that Louise took photos of our work and did a slide presentation at the end of each day with our work. They looked so lovely that some didn’t even know it was their own work on the computer. Again, we had a jam-packed year of artwork and loved every minute of it. 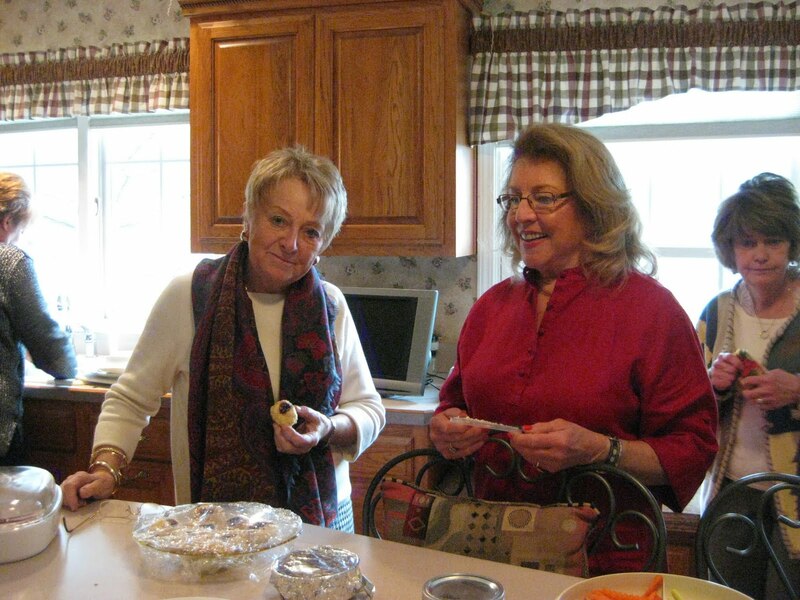 For our December meeting, we all met at Barbara Rogan’s for a recipe exchange and lunch. Thanks Barbara for hosting one of our favorite meetings of the year. 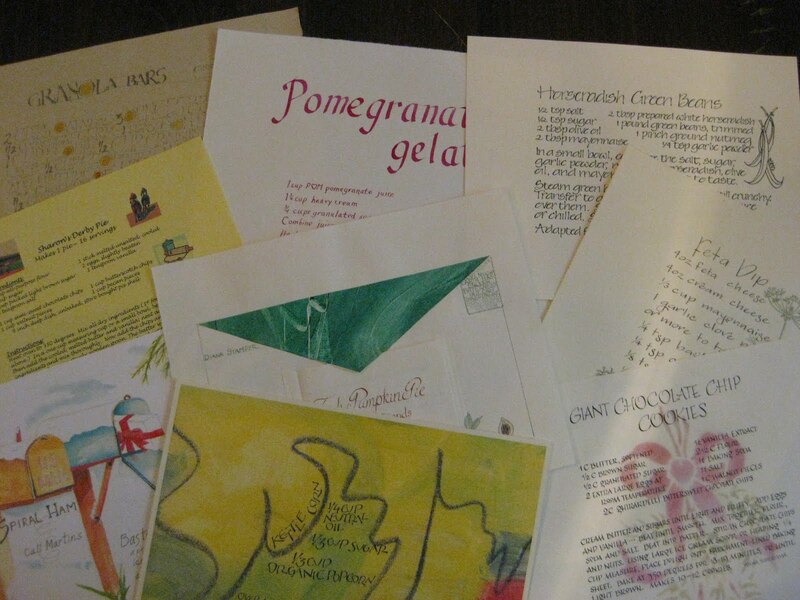 The recipes were all handwritten and then copied to hand out to others instead of Christmas cards this year. We will be taking the originals and having them bound into a book. Even if you didn’t get one done before the Christmas meeting, please consider hand lettering one of your favorite recipes early in 2012 for the recipe book as we would love to include them. Sometime in 2012 we will be raffling off the recipe book which will be a treasure for someone for years to come. Sharon Esmont has offered to bind the original recipe book with a Japanese Binding. Also at our December meeting, we as a group decided to donate money to three different groups. The first was to Christ the King Church where we have our monthly meetings. The second is to the Food Bank and the third is to the Midwest Museum of Art in Elkhart. So, as you can see, we had a fun-filled year of art and if you missed a workshop, we don’t usually have the instructor back for a long time. Please continue to support your guild by membership fees, joining us on the first Saturday of every month that is not a holiday weekend, and by being a participant in a workshop. We only continue to have quality instructors because they are supported by many of you. If we don’t have enough participants, we will not be able to bring quality instructors to the South Bend area. Instructors are generally $500 a day plus travel so we cannot take money out of our pockets if the workshop is not filled. Thanks to everyone who keeps us in the black!! This next year we will be concentrating on lettering at our meetings/study groups. 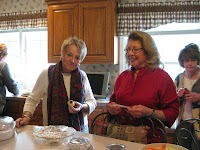 We are going to be celebrating 20 years since Anne Binder and Sylvia Godsey put their heads together and out came the Michiana Calligraphy Guild. Since that time we continue to grow and prosper and have at least two workshops a year that are very well attended by members near and far. And finally, thanks to Sharon who keeps the first Saturday of the month on the church calendar for us, Maureen who keeps our finances up to date, Amber and Renee for the wonderful job on the MCG blog, Jo who reminds us of our monthly meetings and to Anna who houses, feeds and schleps our instructors to and from the airports early in the morning. We couldn’t do it without you! 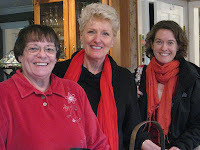 We met with Rosie Kelly for another one day workshop the first day of October. Since this has become an almost annual event, Rosie brought plenty of things for us to play with. She started the day with show and tell of some of her recent experiments with gesso thinned with water. She explained that she is looking for "sweet spots" on her paste papers to add texts. She reminded us that you can add matte medium first for a layered effect and pastels can be added either while the paste paper is wet or after it has dried. Then she showed us the luscious colors of the Twin Rocker aqueous dispersed pigments we would be using. The pigments need a binder of matt medium with the paste, but the colors were vibrant. She set us loose with only an eighth of a piece of text wove. Working with only an eighth of a sheet was a revolution for me. I was able to slow down instead of hurrying to try and get the thing done before the paste was too dry since I am used to working with bigger sheets of Text Wove. Plus, I realized I needed to use the sponges more for application for the look I admire so much with Rosie's paste papers. It was a good day and I walked away with some paste papers to use. Jacqueline Sullivan will be teaching a class on Saturday, April 28 and Sunday, April 29, 2012. The title of Jacqueline’s workshop will be "Visual Poetry", encouraging students to use words only as part of an abstract painting and not as a foreground/background thing. I have now taught this for 4 guilds and people have done some really exciting work. We cover the basics of working on canvas as well as trying to draw an original abstract word painting out of people/ The cost of the workshop will be $100. The workshop location will be Whispering Pines. Jacqueline has been to South Bend several years ago and we welcome her back. As a guild we have used her DVD to create and inspire us with her artwork and textures. Marijo Carney will be teaching brush lettering for a one-day workshop in September. Cost to be announced. We almost had a brush lettering workshop with Marijo a few years ago, but we had to cancel it so we are pleased that Marijo will be joining us to teach brush lettering later this year and has taught design to our guild several years ago. Welcome back, Marijo! Pen Dragons – The Pen Dragons of Kalamazoo will be hosting Barbara Close for a workshop on September 17 & 18 and another workshop with Barbara on September 19. Check out her website to see her work: http://www.bcdezigns.com/BCgallery.htm. The Pen Dragons are very warm and welcoming when you are part of their workshops. They usually fill their workshops, so if you are interested in being a participant in one of their workshops, you may want to consider being a Pen Dragons member to get first dibs! Next year, they will be hosting Pat Blair, White House Calligrapher, in Kalamazoo.